What Is the Meaning of Pranayama? “Prana” when literally translated means spirit or the breath and “Yama” means control. Pranayama is thus loosely translated as prana or breath control. Breathing is the essence of living, yet most of us don’t even notice it. It is so simple and obvious we often take it for granted. It has immense power to affect body, mind and spirit. And it is precisely because we neglect it that we come across so many ailments resulting from improper or shallow breathing. Each inhalation that we take goes into bloodstream as rich oxygen that transforms the food into body fuel and enriches the various cells in a body with oxygen. Each exhalation removes from the body toxins in the form of carbon dioxide. Since supply of oxygen governs the functioning of body cells and organs it also affects our state of mind. It can make us excited or calm, tense or relaxed. It can make our thinking confused or clear. In the yogic terms, air is the primary source of prana or life force, a psycho-physio-spiritual force that permeates the universe. Pranayama is a set of breathing exercises that ancient yogis developed by various techniques to maximize the benefits of prana. Pranayama is used in yoga to help clear and cleanse the body and mind as prelude to yogic postures. It is also used in preparation for meditation to help maximize its benefits and focus the mind. Ujjayi is often called the “sounding” breath or “ocean sounding” breath. It involves constricting the back of the throat while breathing in and out air to create a sound effect coming from the region of the throat somewhere around the thyroid gland, due to friction of the passing air. 1. Acquire a comfortable position with your spine erect. This can be while sitting preferably on the ground in Sukhasana or Vajrasana. For those who cannot sit on ground they can set on a chair at the front edge keeping both the feet flat on ground with back away from the backrest and spine straight. If even this is not possible one can lie down flat on the back. Keep the eyes closed and concentrate on your posture for about a minute and then begin by taking long, slow, and deep breaths through the nostrils. 2. Allow the breathing to be gentle and relaxed as you slightly contract the back of your throat creating a steady hissing sound as you breathe in and out. The sound need not be forced, but it should be loud enough so that if someone came close to you they would hear it. 3. Breath deeply and lengthen the inhalation and the exhalation as much as possible without creating tension anywhere in your body, try to get the sound of the breath to be continuous and smooth. Anytime you want to concentrate and relax your mind. Dirgha means “complete”. Hence this asana is known as the “complete” or “three-part” breath. It involves filling of the three chambers of the lungs, beginning with the lower lungs, and then moving up through the thoracic region or the middle portion of the lungs and into then the clavicular region or the upper portion. Adopt a comfortable position as in Ujjayi Pranayama. Sit with your spine erect, or lie down on your back. Keep the eyes closed, and concentrate on your body position. Thereafter begin taking long, slow, and deep breaths through the nostrils. Imagine your lungs as made up of three distinct regions. The lowermost part the middle part and the top part. As you inhale, allow the belly or the lowermost part to fill with air first, drawing air deep into the lower lungs. Continue inhaling air without stopping and fill up the middle portion of the lungs and thereafter the top portion, all in one long breath. After inhaling fully, stop briefly and start in exhaling. 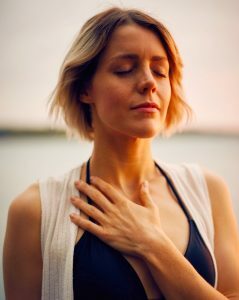 As you exhale, allow the belly to deflate like a balloon in the reverse order, that is – first vacate the topmost portion of the lungs , then the middle portion and thereafter the lower portion or the belly region, Repeat three to five times, keeping the breath smooth and relaxed, and never strain. After one week of this practice, the number of accounts can be increased to seven or more as per practice and endurance. Nadi means channels and refers to the energy pathways through which prana flows and Shodhanameans cleansing, so Nadi Shodhana means channel cleaning. Sit in a comfortable position as explained in the first two methods above. Hold your right hand up and curl your index and middle fingers toward your palm to make a sort of figure of “V” with the thumb and little finger. Place your thumb next to your right nostril and your ring finger and pinky by your left. Keeping your eyes closed concentrate on breathing in and out of air. Close the left nostril by pressing it gently with your ring finger and pinky, and inhale through the right nostril. The breath should be slow, steady and full. Now close the right nostril by pressing gently against it with your thumb, and open your left nostril by relaxing your ring finger and pinky and exhale fully with a slow and steady breath. Inhale through the left nostril, close it, and then exhale through the right nostril. Inhale through the left ; Exhale through the right. In short, inhale to the nostril with which you exhale last and after inhaling exhale from the other nostril. Begin with 5-10 rounds and add more as you feel ready. Remember to keep your breathing slow, easy and full. Concentrate on your forehead and ensure that it does not become strained. If you feel out of breath, stop immediately, lie down for a few minutes. Take normal breaths and if you feel up to it, you can restart. The biggest benefit is that it promotes clear thinking, calms the mind, soothes anxiety and stress, balances left and right hemispheres of brain. Before meditation and whenever you are stressed and wish to relax. You can also do it as part of your centering before beginning an asana or posture routine.